The class of 1964 is celebrating its 50th reunion and we plan to make this the best reunion ever! We've come through Vietnam, Watergate, 9/11, gulf wars and have witnessed the election and re-election of the first African-American president. Along the way, we learned who we are and what and whom we hold dear. We're older. We're wiser. We are thankful for the blessings of friends, families and good health. We look back to the youthful days of the 1960's when we were carefree and full of hope and promise. We remember friends and good times. Welcome back Rough Riders! It's been too long since we got together. Hello Everyone! The Reunion Committee is hard at work planning the fabulous 50th. We're searching for classmates near and far. Looking forward to dancing to old school favorites and reconnecting with friends from back in the day. Working hard for a successful reunion. The first step to having a successful reunion is locating and contacting the members of the class of 1964. Rough Riders we need your help. Please send us your contact information and ask any classmates that you come into contact with to submit their info as well. Once we get the names and contact information we will begin sending out up-dates as the planning goes forward. Also check this website and our new Facebook page for up-dates and information. I heard it through the grapevine that we have successfully located 100 classmates. If you want to find someone, just put Barbara on the case, congratulations to the communications committee for our reunion. Check out the missing page to see who else we need to find. Make that almost 150 classmates found!! It is amazing to find out that Rough Riders have moved to just about everywhere across the country. Yes, we survived Watergate, Vietnam , celebrated the election of the first African American President, but don't forget Social Security. Looking forward to the reunion. 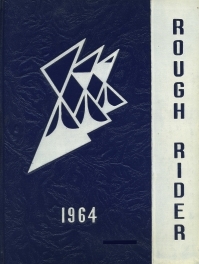 Great news Rough Riders, we have identified and located 100 members of the Class of 1964. We are well on our way to having an incredible 50th class reunion. I want to thank Barbara Harris Jarvis for the incredible job she has done tracking down our former classmates. Her detective skills and boundless energy have been incredible. There is more work to do however, so if you were a member of the Class of 1964 or you know how to contact members of our class please let us know. Use the "Contact Us" tab on this website and send us a email with any information you may have. We want to reach out to as many of our former classmates as possible, so if you can help please let us know. That praise from one with your creative abilities let's me know that our classmates know how to "do it"! Pass the word! The Committee is working hard planning a fabulous 50th. We're searching for folks, looking at venues, and brainstorming! I am excited about the possibility of a successful 50th Class Reunion. It will be great to see folks I haven't seen in 10 years and 50. Wow, 50? Looking through the yearbook brings back memories. Yes--50 years! I'm sure our kids think we're dinosaurs and perhaps we are but just don't know it. Check out the photo albums page to see how we looked a half century ago. Seems like only yesterday. I'm looking forward to the reunion, as well. Who knows where we'll be, or in what condition, for the next reunion. Thank you all (TRHS Golden Reunion Committee) for the tremendous work you are doing. The website is "Out Of This World". I CAN'T WAIT!! Outstanding website! Congratulations Class of 1964. Enjoy your celebration! I graduated in the Class of '67 and I just want to say I really enjoyed viewing your website. You all are doing a wonderful job with putting the website together. Keep up the great work and I know you all will have a blast at your reunion. Take Care. Looking forward to seeing everyone for our BIG one. I actually graduated in 1963 because I skipped second grade,but my heart and friendships are with the class of 1964. The reason is that I always identified with my age group (now 66 and loving it). I lived and worked in St. Thomas, Virgin Islands for 25 years, lived in Atlanta for 3 years, and currently in West Palm Beach, Florida (11 years). Looking forward to seeing my peeps. I haven't seen you in ages!! Glad to know your heart is with the Class of '64. See you at the reunion. Only a year to go till the reunion! I already sent my rsvp and purchased my ticket. Can hardly wait till next fall. Do you know my wife? She attended Roosevelt, too. I am looking forward to seeing my "golden" classmates! Can't believe it has been 50 years since we left good ol' Roosevelt High. Looking forward to the 50th class reunion and seeing all of my classmates. My only regret is that my BFF Olivia (Mickey) Cammack is no longer with us. See you all soon, God willing. Happy New Year. We're about 11 months away from our 50th reunion celebration. I hope you are as excited about this opportunity to see old friends and classmate as I am. Have you RSVP'ed yet. If you haven't take a couple of moments, visit the RSVP page of the website and let us know if you plan to attend. Even if you're not ready to purchase your tickets right now, just let us know if you're coming. Soon we will have to provide headcounts to our caterers and other vendors and you can help by giving us your RSVP. We are working to make this reunion a truly memorable weekend and will soon be posting more information about both days' events. We look forward to hearing from you and seeing you in November. Big ups to the committee for all the work and an outstanding website!! The RHS store is a nice touch. The check is in the mail. Hi Rough Riders! Tonight is Emmy night and one of the front runners for the award is "Twelve Years A Slave". So you ask, "what's that got to do with TRHS?" Glad you asked. Tonight, Roosevelt grad, Marvin Talley, was the MC for an AFRH-W and C-Span (3) Black History Month TV Program that featured the actual descendants of Solomon Northrop. Way to go Marvin! The program was informative and provided a perspective that can only be gained from the actual "family" of Solomon Northrop. Way to go Marvin! If we don't help tell our story, no one else will. Let's hope the Academy recognizes and rewards the power of our story. Hoping to see '64 classmates at the RHS Alumni Picnic. Saturday, July 12 at the Carter Baron across from the tennis courts. Come for a day of fun, food and friends. We're on the warpath and the warpath's hot! We are preparing two Roosevelt packages ( tote bag and cooler) to raffle off at the Roosevelt All Class Picnic... Saturday, July 12, 2014 at Rock Creek Park across from the tennis courts at the Carter Baron. You are going to love them! Don't miss the opportunity to give your orange and blue support to the Class of 1964!